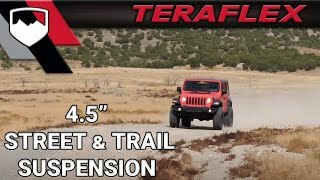 These all-inclusive TeraFlex Sport ST (Street & Trail) Suspensions Systems deliver true street & trail (ST) performance and capability in a dependable and maintenance-free package. The 4.5” Sport ST4 Suspension System’s higher lift height allows for larger tires and a dominating stance, while maintaining a comfortable and stable ride on both highway and trail. TeraFlex’s robust Front Control Arm Sport Brackets provide steering geometry correction as well as positive braking control with reduced nose dive. All Sport ST Suspension Systems feature coil springs and bump stops optimized for stated lift height as well as tire and component clearance. The Sport ST3 and Sport ST4 feature our Front Control Arm Sport Brackets that optimize caster and pinion angles to restore front suspension geometry. These systems also include Front (3.5”+) and Rear (2.5”) Track Bar Brackets to improve steering response, optimize vehicle roll center, and reduce body roll for unsurpassed handling. This results in a simple “install and drive” bolt-on installation with no cutting, welding, or alignment required. These maintenance-free suspension systems provide superior on-road ride quality and comfort with maximum off-road flex. TeraFlex suspension systems provide reduced noise, vibration, and harshness (NVH). Sport ST Suspension Systems can be installed on Friday, wheeled on Saturday, and driven to church on Sunday! We recommend Falcon Performance Shocks. Falcon shock absorbers and TeraFlex lift coil springs have been engineered together to improve both compression and rebound for optimal vehicle stability. The Sport ST4 Suspension Systems is offered with a choice of Falcon Series 3.3 Fast Adjust Piggyback Shocks or Series 3.1 Piggyback Shocks or without shock absorbers. • Requires aftermarket wheels w/ 4.75” backspacing or less – or Offset Wheel Adapters for stock wheels – NOT INCLUDED. • Models with plastic bumpers require removal of bumper-to-fender wind deflector/splash guards in order to fit 35” or larger tires. • Sport/Sahara Fenders require 3” front and 2.5” rear bump stop extensions and shims (included) in order to fit 35” tires. • Sport/Sahara Fenders require 3.5” front and 4” rear bump stop extensions and shims in order to fit 37” tires. Requires an additional 0.5” Front & Rear Bump Stop Strike Pad Shim Kit (# 1959300) – NOT INCLUDED. • Rubicon Fenders require 2.5” front and 3” rear bump stop extensions and shims (included) in order to fit 37” tires. • Aftermarket High Fenders required to fit 39”+ tires. Bump stop extension and shim requirements will vary based on setup including wheel/tire combination, shock collapsed length, and fenders. Installer must check for clearances. We recommend an additional 0.5” Front & Rear Bump Stop Strike Pad Shim Kit (# 1959300) – NOT INCLUDED. • JL/JLU: Sport Bracket HD Reinforcement Kit (# 1938115) beefs up the Front Control Arm Sport Brackets. Recommended, but not required. • Requires longer shocks (not included in base kit) – Falcon Performance Shocks recommended. Log in to review this item!